Oumuamua, Maybe Not Aliens, But Alien. 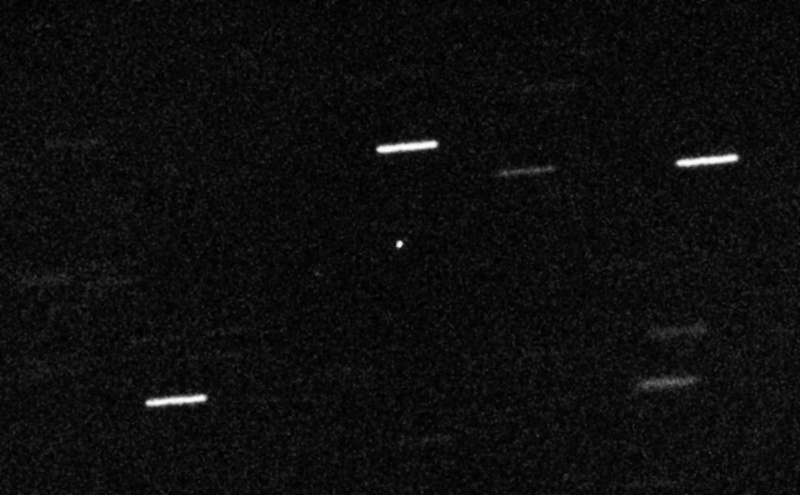 Oumuamua the object which passed through our solar system in October 2017 with a trajectory that indicates it was not of this solar system was never photographed. We only saw a point of light that that changes in brightness as it rotates. There could be many reasons a natural body might change greatly in brightness, trajectory, and velocity as it rotates. In all the randomness of collisions between bodies in the heavens almost anything is possible. However, when it comes to alien life, we have to be careful. No one or two things can give us reasonable certainty. In an interview published by the New Yorker, Harvard Professor Avi Loeb, Chairperson of their department made some good points for why that object could have been an alien probe. Those points are the rate of speed of the object in relation to nearby stars, it has no sign of a cometary tail, that the change in brightness as it rotates taken with the presumed effect of sunlight on its trajectory mean it has to be a mm thin. The strongest point is that the existence of at least one more technological civilization of around our level is not speculative. We have to consider that something like this could be of intelligent alien origin. However, we have to give much greater weight to this object having been of unintelligent natural origin. Occasionally, in the life of a solar system large bodies, such as planets collide. They almost destroy eachother. The accepted theory of the formation of our own Moon requires a collision between the proto Earth and a body about the size of Mars that formed at one of the Sun Earth Lagrange points. After that Earth was hit at least six times by objects measuring hundreds of kilometers in diameter. When these things happen, they release massive amounts of energy. They also release many oddly shaped blobs of molten rock, and shards of not so molten rock. These objects will fly off in every direction. Most of the material will be captured by gravity and stay within the solar system where the collision occurred. What would a probe sent by aliens do? In all the heavens is it unlikely that a probe sent from a “nearby” (say about 3000 lt years) star would pass through our solar system and not somehow achieve an orbit around the Sun, or attempt communication by radio. At a distance of 3000 light years or so it would take on the order of tens of thousands of years for a probe to reach us using a light sail. There would be no sign of technology that aliens could detect here back then. There would be signs of a habitable Earth type planet. The number one reason to send a probe would be to check out Earth and the other planets. To conceptualize this think of a three-legged stool, like the one I described for deciding if a planet is playing host to intelligent life. We need the object to have the characteristics described by Avi Loeb. These … Loeb characteristics are a trajectory which does not correspond to the simple gravitational ejection of a body from a solar system, a shape which is unlikely to be natural, and a trajectory through our solar system which is not explainable by gravity alone. Our very own space probes would have these characteristics. That is one leg of the stool. We need the presence of some radio signals indicating that the object is electronically active or some other attempt at communication by use of electromagnetic waves. For example, a probe sent to visit a star would likely be designed to go dormant if not near to the solar system it was sent to observe. Lastly, we need to have spectral observations of the object which indicate that it is made of engineered materials such as metal alloys, plastics and/or semiconductors. A photograph that shows an artificially constructed body in our solar system could provide all three legs of the stool. Since if we can photograph something, we can work out it’s physical characteristics, read markings on it (communication) and analyze its composition and construction. In conclusion we don’t know what Oumuamua was. We can’t rule out aliens but the lack of communication and observations to tell us what it was made of make a unintelligent origin more likely.